A couple of online file synchronization services have just popped up into my field of vision. One, called Dropbox, is in private beta at the moment and I've only just managed to get an invite after months of waiting and the other is called OpenDrive, which is in public beta. 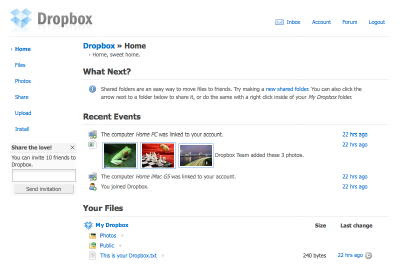 Once you sign up to Dropbox, you can download the client software for both Mac OS X and Windows. This application run fairly unobtrusively in the system tray on Windows and on the menu bar on the Mac and it creates a folder on the user account space where you can drop files and folders you want to share with other systems or access online. Obviously the keyword here is synchronization so when you make a change to any of these files, it gets synchronized across all of the systems registered with your account as soon as they connect to the Internet. You can also upload files from your web browser so your space is accessible and updatable from anywhere you happen to be. Added to all this is the ability to share a folder with others and even invite them to collaborate with you so they can edit your files as well. When a file gets updated, you'll get a little notification about it too so you can keep up to date with what's in your Dropbox folder contents. The system also keeps a track of when files were updated, deleted or moved so you can keep track of revisions and history if need be and, if necessary, revert to an earlier revision. The beta accounts are getting up to 2Gbs of free storage and the developers are looking to implement paid-for extra storage plans once the system goes live. OpenDrive is is similar in that, once you sign up, you get to download the client software. Windows only though at the moment though but a Mac OS X version and even a mobile device version is in the pipeline. OpenDrive works by installing a drive image under the My Computer area of your PC and any file or folder you drop in there, edit, delete or move gets synchronized with your online account. It all happens automatically and you don't need to schedule an update. Like Dropbox, synchronization works both ways so any changes are reflected on all systems attached to the same Opendrive account. Files and folders in your OpenDrive can be made public, private or even hidden to anyone but yourself and sharing them out is easy. Right-click on a file in the Opendrive and you'll get a URL you can give out to share the item. Opendrive is a product the people behind online storage service BOXSTr and if you're already a BOXSTr member, then you don't need to sign up for Opendrive again. Indeed, web access to your OpenDrive storage is via the BOXSTr interface for the moment although that may change in the future. Free accounts have been allocated only 1Gb of storage for OpenDrive, which is strange considering BOXSTr offers 5Gb for free. Maybe they'll get these services inline once further down the development trail but it's worth keeping an eye on. Just when you find things like this, another couple pop up. Syncplicity are both similar services to Dropbox and OpenDrive, offering 2Gbs of storage for free. SpiderOak is multiplatform (Mac OS X, Windows and Unix) while Syncplicity is Windows only at the moment but a Mac version is planned for release later in the year. I could also have mentioned FolderShare, a company bought up by Microsoft a while ago with the idea of bringing it into their Windows Live environment. FolderShare allows synchronization and sharing between machines, no server required, and it supports both Mac OS X and Windows. However, it hasn't been developed much of late and I'm wondering if it'll be superceded by Microsoft's Windows Live Mesh service. You definitely have to take a look at nomadesk. Aye but nomadesk isn't free and that's a big drawback against the likes of Dropbox and Opendrive where you can use your own systems. Dropbox now available to everyone. It will be interesting to see their pricing structure. "Our most common request has been for more storage. Next week, you’ll be able to buy a 50GB Dropbox for $9.99/month, or $99.99/year. Don’t worry — the free 2GB accounts will always be free, and you can keep the amount of space you had in the beta. Stay tuned for more on this."